Market timing is key -- and that's for both entries & exits. It really is that simple. Are you getting in to the upside at support and getting out at resistance, vice versa to the downside? That has plagued millions of people all around the world for decades. People have lost so much money for lack of knowledge, patience, poor discipline, poor risk management. Wow, I've fallen into that category more than once. As I contemplate this, I think of my singlehood. Like Trading Goddess, we're both single. At least, I think she is. Correct me if I'm wrong. Two amazing women (her and me), traders, with lovely children, both single. Not that I need a man. But, it would be nice to be with the right man. For those of you in wonderful marriages (you men) where you adore your wives and have been married for awhile, how did your wife capture your hearts? What qualities in her did you love? still love? How do you keep the romance & flames alive? Does she still capture your heart? Do you love her more now than you did when you first got together? I'm gathering, Trading Goddess and I have some common traits, and then, some not. We're both unconventional and risk-takers, strong women. When a guy says he wants a strong, independent woman who is sure of herself, does he really? What if she made more money than you? What if she expects you to rise to YOUR best, to challenge you and won't except less than your best. I'm not talking about a gold digger. If there's a really good book out there or resource that has GOOD men pegged that I can read and learn from, I'm all ears. I'm willing to learn. Picking the wrong men, I've done. So, just stopping and learning what in me caused me to attract those type of men, and changing ME. What I found is those voids, the neediness, the lack of self-esteem really caused me to attract the men I did. Would my life be good without a man? YES. Definitely. I have a good life now (yes, some big challenges, but my life is still very good). In fact, it's a great life. I'm very blessed, am so surrounded with love and many good things. I'm able to see opportunities abounding all over the place. Emotionally, I'm becoming more balanced and stable. Interferences are less bothersome. In fact, I'm learning to really master life's interferences and see them as stepping stones. The market is so amazing. It really is very reflective of our lives. Make some strides forward, move back a little. It's back and forth. Sometimes we have huge downturns, but in the market, that basically means adjustments. Adjustments aren't bad, especially if you are prepared for them and can take advantage of them. As I soon will be embarking on the dating scene, I've decided to rethink this approach. I wasn't going to do the conventional "dating" thing, but it might be fun. Someone asked recently, "how many nights a week do you go out?" Sad to say, but ZERO. That's a big fat ZERO. I spend my evenings with my kids or on the 1 night a month, alone, just basquing in time alone. Maybe my former spouse wanting more time with the kids wouldn't be so bad. The kids do need their father, and the time alone to form new relationships would be good for me. Honestly, I don't know that outside of being a mommy or trader, who am I? Yes, I'm a godly woman after God's own heart, but who am I? I've never had a romantic relationship with a man that was healthy. It intrigues me. Maybe just casually dating would allow me to see men differently than I've seen them all my life -- businesswise and as friends. What a wonderful opportunity to learn more about men, to test things out. I'm still working on the woman I want to be. In 6 months from now, my finances will be so much more sound. My therapist is helping me so much with my emotional soundness. I know as God's working on me, He's working on my Mr. Right. I'm looking forward to meeting him, if I don't already know him. Futures, if you manage your risk properly, have a good trading plan & strategies, is really a wonderful place to make money. The market does not always move all the time, but if you figure out how much you need, you can determine how much time you need to spend trading. Most people are going to fall somewhere within one of these that they need to make. Of course, as I write this, it sounds SOOOOo simple. In a sense, it IS simple. In a different sense, most of us have disbelief, self-doubt, lack of knowledge, lack of discipline, poor risk management, too much emotional baggage to do this. However, if you work at each of those aspects and begin making right choices, it is highly possible to not sit at the computer all day and generate MORE money than you ever thought possible in a fairly short amount of time. Start small, maybe even doing $50/day and do that consistently for a month, 2, 3 or whatever. That will give you possible an extra $2700 to trade with in 3 months after commissions. Your psyche will be able to handle you increasing it to $100/day. Do that for another month or 2, then go to $200/day, then $300. Along the way, deal with your thoughts & emotions and anything that is revealed as you trade. Imagine in a year or 2 that you're making nearly $700/hr and only trading for an hr or 2 a day. If you want to make more money, increase your contract size. You don't want to do this carelessly, though. Trading futures has greater risks than trading options or stocks. Anyway, gotta go get one of my dogs and hit my kids' school. I had to work through quite a bit and I don't even know what it was that has caused me to be more neutral. In my mind, being neutral is best. It keeps us objective, not "hoping", so that if a trade goes against us, we get out. For a long time, I just really liked making money when the market was tanking. In a sadistic way, it was fun. Then, when things started to change and go back up some, even if it's only for a few months, to only play bearish in a bullish period of time will only cost you money. I've noticed this past week, I've taken just as many bearish trades as I have bullish. Even when the day is tanking, I no longer have that really excited feel, rather the market does whatever it does. It's right and I'm fine with it. No opinion whatsoever. Somehow, not being excited, rather being neutral in my emotions WHILE trading is serving me far better. I zero in and focus on THAT trade. Once that trade is done, reset the mind to focus on the NEXT trade. The one before is done, finished. One of the things about daytrading, sometimes scalping, you need to be able to quickly change, redirect & focus. Of course, plan your trade, trade your plan. How many times have you heard that? It's NOT overrated. I do get excited every time -- exaggerated excited -- I make a profit. When I have a costing trade, I observe that -- note it, what I might have done right or wrong, move on. Dominant energy wins. My body, mind and spirit is becoming more adapted to taking profits more consistently. I'm just slightly better funded. Some days I ONLY do funded trades, but most days, I do a combination of both. I'm leaning more towards just funded, but only if I'm feeling good enough. My costing trades are typically smaller than my profitable trades, if anyone is curious. Just taking one trade, one day at a time. Continually developing discipline, building my knowledge base, managing risk, being aware of my thoughts & feelings and developing greater emotionally resiliency so I can better focus. Sleep is NOT overrated. Now, if all you do is sleep, that might be another thing, but if you're a person that thinks that cutting back on sleep to say 3-4 hrs a night to get more work done, that's really not a good thing. Now, I know, some of you workaholics think, "Why should I sleep more if I get more done before 6 am than most people do in day?" Hey, I used to think that very thing. In fact, I did that from probably 18 yrs to 37-38 yrs old. A LONG time. I read these articles about if you want to lose weight, you need to get enough sleep, a minimum of 6 hrs, but really, 7-8 is more desirable. That wasn't enough to convince me, but learning that certain hormones work around the 6 hr period ONLY if we're sleeping DID convince me. Those are some of the hormones that help your metabolism. Mind you, I exercised DAILY for about 2 hrs/day, sometimes more. Yes, I was a wife and I'm a mommy of 2 kids, AND, I worked at a full-time engineering job for 1.5 decades. Most nights, I rarely got above 4 hrs of sleep. No wonder why I couldn't lose weight even with my really healthy eating & exercise. The lack of sleep ONLY stressed my body out more, rather than give it the rest it needed to heal and function properly. This would include brain functioning. Even God rested on the 7th day and I worked all the time. Hmmmm . . . I'm certainly not better than God. There is NO comparison. He's way out of my league. Anyway (one of my friends pointed out I use this word a lot), on the days it seems like I get enough sleep and can focus, trading is good. Oh, forgot, the most important thing -- PUT GOD FIRST. God empowers me to be able to trade well. God is good. So far this week, I've had 3 profitable days, 1 costing day. Hopefully tomorrow will be another profitable day. I reset my goals a few weeks ago to be less aggressive until I am consistent again with all that I have going on. God is blessing. Thank you God! This morning I was doing fine trading, profitable. Two minutes before going out the door to take my kids to school, I decided to take on 2 trades. Not very good. That 2 min. trade turned into 8 minutes and therefore, made my daughter late to school. I was not profitable. First trade was costing, and the second trade was the same as the costing trade yet profitable. I would've broken even minus the commissions. Later in the day, I got home shortly before needing to leave to my therapist's. I had maybe 5 min. and almost took a trade and remembered what happened earlier that morning. I wasn't about to leave any of my trades unattended. Probably could've, but didn't. My trailing stop thing isn't working. Learn, learn, learn. Do not trade right before you need to trade, even if you think it'll be a quick profit, because most likely, it isn't. One of the things I'm always asking in trading is: "Are we there yet?" This would refer to either support or resistance. For me, daytrading, there are lots of S/Rs, depending upon each timeframe you are using. How do you tell if it's S/R? Are you at a Fib #? 38.2%, 50%, 61.8%? How much activity to the left of the chart is at this point? Meaning, was this a previous S/R? These would be deemed pivot points. 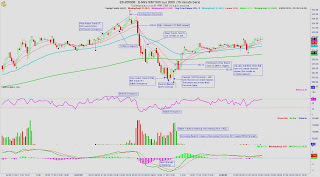 Is price action following any moving averages (MA)? Meaning, does it tag a certain MA and begin moving back in the same direction or against it? Since I use candles, what do these tell you? Are there lots of dojis? Where are you on RSI? Overbought? Oversold? This chart is of the ES (S&P emini's - futures) on a 15-min. timeframe. I forgot to add volume to this. As you can see from this chart, at the beginning of the day, this was forming a pennant wedge. It broke out to the downside within the first hour of the market. It took about 4.5 hrs to go from the top (914.50) to the bottom (894), which is 20.50 points. On one contract of the ES, if you held it through, would've been a $1025, which would've been a 200% ROI using my futures broker. That's REALLY good money. However, I did not want to get in, even though signs were showing things were going more bearish, until it truly broke the pennant, which is when I entered. Since my kids are up during that time, I do trade cautiously, taking smaller profits as they come. See the next chart. Today I placed 13 trades. You can see most of them on here and there is some overlap, and some profits got taken very quickly, so you don't really see the "green", which indicate profitable trades. All my trades today are profitable, which is rare that I would have this many trades in a row profitable. As I look back at the trades, there are obviously many things I could've done much better. For example, as the price action goes quickly down, I could've kept moving my stop down. However, as I've learned from other trades, sometimes one just needs to take profits as they come. Things develop differently at times during real time, which this was what I was doing, than hindsight. Plus, as I mentioned before, my kids were up and getting ready for school, and I was not totally sitting at the computer. I would make a trade, set my stops and walk away. They would be OCO (one cancels other), just in case my trade turned against me. Somehow the trailing stop feature hasn't been working on my trading platform for the past 2-3 weeks, so I need to talk to Genesis about this, because it sure would've come in handy here. Having a trailing stop would've allowed me to take bigger profits, but the profits I did take were good and no complaints here. If you'll notice, there was strong selling action and the range was big, but after 3 interations, each selling action got smaller. There were 3 phases of this, each time testing to see if the support it was wanting to find was really "it" or not. Once it saw it was it, it reversed. 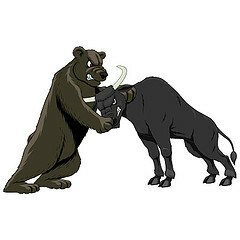 The reversal provided another opportunity to see if the bulls will come in or not, and if we look at the bigger 15 min. picture again, we can see an even greater pennant wedge forming. I personally would wait for the breakout at this point and play that. The pennant wedge is basically a compression pattern where pressure is building. One of the things I learned that the more it goes into the wedge, the less the umphf of the pressure release. Let's see if that's the case or not. Well, if I remember to write on this, it will be Thursday as tomorrow my schedule is pretty full. I can only trade for a short amount of time. Today, I actually used a combination of the 15-min. and the 3 min. 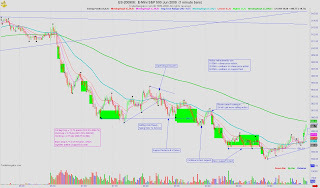 charts to trade, and not the 1 min. But, the 1 min. gave an easier "look" to my trades than the 3 min. This is the last post I'm doing and then I'm going to bed. It's 3:36 am and normally I'm awake 5-6 am (I'm a natural morning person). I was attempting to figure out from economic news why there was about a 30 pt drop yesterday in the market, and I couldn't figure it out. News was good. Maybe it was something else. Honestly, I'm not a news driven person, as I don't have time to keep up with all that as I attend to my children, business, and personal stuff. So, with this chart, technically, I evaluated what happened yesterday. About 24 hrs ago, the market was moving up in price action while RSI was moving down. This signifies Bearish Divergence. 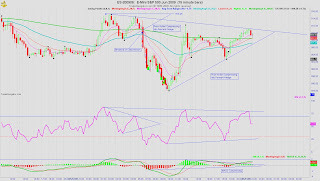 With the shooting star candlestick pattern, that signifies a potential reversal. Another indication is the bearish volume RELATIVE to the previous volumes, was significantly higher. Yes, this is premarket. Also, MACD on the bullish side was weakening. This signifies a weakening in the bullish trend and one should be cautious as to when a reversal is going to happen. If you were trading during this time, the stop to get out of this trade could be @ 923 or just below that. I've noticed that on fairly steep up or downtrends, the market uses the 10 EMA as support (or resistance if going down). On less steep up/down trends, it can alternate between the 10 and 20 EMA. As the markets open, there is a steepness as things begin to tank. The numbers for initial claims came in a lot better than expected, yet the market tanks. Buy on rumor, sell on actual? Maybe people just taking profits? I didn't get a chance to further annotate this chart as it would've been really messy, but follow me down. The 8-8:15 am MST timeframe, it bounces on the 200 EMA of this 15 min. chart. Is this a reversal? Looking at volumes, bullish volumes are decreasing as price goes up, so this means there is no strength in the bullish move, so it's most likely a retracement, which that is what it turns out to be. It tags the 10 EMA and begins to head down again for the next run down. Bearish volume is much stronger than bullish, HOWEVER, it's not as strong as earlier that morning, meaning the profit taking could be about over. At 10:45 am MST, there are 4 candles that have approximately the same range. Testing which direction they want to take. One more attempt at 11:45 am MST to see if they can bring in more buyers. Bearish volume strength is still more than Bullish, but in MACD, it's weakening in bearish and this cycle of a push down is far weaker than the intial -- making this further confirmation that sellers are losing strength. We get an inverted hammer, which has a 62% reversal statistically. So, most likely a reversal but not a sure thing. They spend the next 15 more minutes testing for both buyers and sellers. We are now in bullish divergence on the RSI, weak bearish MACD. Overall closing prices are higher, which does not match with volume in terms of bear strength. At 12:30 pm MST, let's see if in the last 45 min. they can bring in buyers. Bullish volume is increasing with price action, however, bearish volume is STILL stronger. At 12:45 pm MST, we get a very LONG hammer, which is a statistically less of a reversal signal with 44% reversal possibility, less than half. The long tail signifies a last ditch effort to see if there are anymore sellers, and it seems they cannot as price action continues to move higher. So, if they can't bring in sellers, what do they do? Go UP! Bullish Volume now supports price action, as there is strength in both. It's now starting to reverse to the upside, MACD bullishness is gaining strength, and it confirms the bullish divergence seen earlier in RSI. The close of the 1 pm MST candle is an inverted hammer, which is now 3 reversal candles and we can now assume this IS support. MACD continues to be bullish. Candles are mainly now marching above the 20 EMA, minus 2 candles. This bears repeating, but I can't quite remember when I said this, technical analysis ROCKS!!! There is no way I can put up a line before things happen in the market, and it comes to touch that line and reverse from there or trace. What are the questions ANY person might ask whether investor or trader? When is a good time to get in? More specifically, for those who only play to the upside, is, "When is a good time to buy?" That one may seem obvious, but many people find themselves buying when they should be selling or just waiting. The best time to buy is when you're at support (aka "The Bottom"). You're getting things at a wholesale price. Who doesn't like a good bargain. The key, then, is to understand where that bottom is. 1. EVERYONE I know is buying it. How do you know they are right? 2. The analysts tell me that it's a good buy. Let me let you in on a little secret. If they're telling you to BUY, DON'T. That's secret code to tell the big guys and others that it's time to SELL. Of course, once you realize this, it's too late. The prices have dropped considerably and if you get out, it'll be a huge loss for you, so you hang on, HOPING it'll come up. It's GOT TO come up. You just KNOW it's got to come up. Sound familiar? You don't know Jack Sh** whether it's going to come up or not. You just HOPE. Hope = Dope. 3. You know a friend of a friend that KNOWS this is a good product, service, whatever, and if you get in now, it's a sure bet. Yes, it's a sure bet that you'll lose your money. Have you done your due diligence with the company? I mean REAL due diligence, not just a bunch of heresay. This is not venture capitalism, because those real venture capitalists do their due diligence. Yes, we probably all know people who have invested in company XYZ and years later (i.e., Yahoo or Google or whatever), they became bazillionaires by doing nothing because the stock went through the roof and they were able to cash out. How many people do we know that have done the same thing and have NOT become bazillionaires? Back to technical analysis. 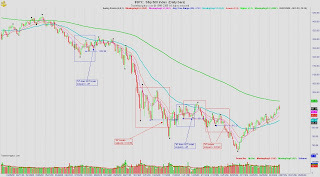 Good technical analysis allows you to look at the markets, stock, or whatever objectively. You're not jaded by news, the economy, world events or at the whims of people. Traders, those who control the markets, move in patterns. We all are human, with behaviorial patterns. The market is NOT random. It moves in patterns. When you can determine where supports & resistances (whether major or minor), this will change how you're able to make money. @ SUPPORT: Go long, BUY, CALLS. @ RESISTANCE: Go short, SELL, PUTS. It's really what it boils down to. As a technical trader, if you look back at my charts, they show the technical parameters I use. It's up to me to decipher them and to make them work for me. There is often a fine line between support & resistance, as they can almost act like one in the same, but they are not. One of the things that makes a trader successful is to get out of costing trades quickly to minimize costs and to let the profitable trades run. You don't even have to be right most of the time if you do this. You could feasible be right ONLY 30-40% of the time and still be highly profitable. I continue to hone my skills at determining whether I'm at Support or Resistance. The market tells me. Am I sharp enough to notice and execute properly? Learning and getting there. Whether you are a daytrader, swing trader, or investor, it's always good to have a good understanding of the various perspectives of the market from a micro to a macro view, at least technically. As a daytrader, I find that it is neither good nor bad that the market goes up or down. It's just a direction. I start in cash daily and end in cash daily. No big deal for me. However, for those swing trading to investor, this does make a difference. However, as a daytrader, it's still important for me to understand from a macro view what is going on. The past 2 months, we've seen the market hit lows it's not seen since Sep'96, which is nearly 13 yrs, and rebound from here. YEARLY: It took 3 yrs the prior time this happened in what it did in ONE year. The longer wicks is testing for more selling action. Can we bring in more sellers. Where this year closes (which will be on 31-Dec-2009) will be very important. If it closes above 903, that will be good. 50% retracement is at 1120, which is near the close of 2003 @ 1111.92. 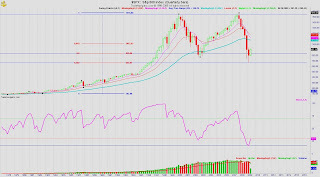 Something that is noteworthy is the close of 2008 (903.25) is higher than 2002 (879.82). So, if we are looking at the "M" pattern, that is a good thing. However, if this year closes below 879.82, that would signify REALLY bearishness, as the other charts indicate more bearishness to come. HOW TO PLAY: More bullish long-term possibly for the years investor. QUARTERLY: Based upon what I talked about in the prior post of "M" patterns, this chart shows more bearishness and greater strength. HOW TO PLAY: More bearish moderate long-term for the investor holding maybe from months to a few years. MONTHLY: In a downward trend and perhaps in retracement. Not confirmed whether this is a true reversal or not. At 38.2% retracement, it coincides with the 200 EMA. HOW TO PLAY: Bullish for maybe a few months. If it gets to 1003 and begins pulling back, you want to get out of your bullish trades. It can still go to 50% retracement, which that point is 1119. If it stalls here, you want to get out. DAILY: In an upward trend. The 200 EMA is about 950. It will most likely test this, but may be pulling back to the 10 or 20 EMA (890, 870, respectively) for the next couple days. Those would be good entries to the upside. HOW TO PLAY: Bullish in the 870-890 range to 950ish. HOURLY: Overall trend is bullish. HOW TO PLAY: If above 910, go bullish. If below 896, go bearish. MINUTE: Trend changes often. Right now it's bullish. HOW TO PLAY: I cannot say for this right now as earlier today it was bearish, but right now as I write this, it's bullish. Not sure if you can tell the "M" patterns here as distinctly as in the Monthly chart, but I wanted to share with my readers about just observing patterns in the market. We are looking for the "M" patterns. I've just identified 5 "M" patterns on the Daily S&P chart. There are more than that here, but I just wanted to show 2 bullish and 3 bearish patterns. In each of these, when the midpoint of the "M" pattern was broken to the downside, price action went bearish. This goes in conjunction with my prior post and observation the "M" midpoint was broken to the downside. Yet, at this very moment, we are in a bullish tendency. This chart is DAILY, which is a different perspective than the MONTHLY or QUARTERLY. "W" patterns work similarly. If you break the midpoint of the "W", that is a bullish signal. For all intensive purposes, I'll just speak of the "M" right now. If you have an "M" pattern where the second hump is lower than the first, that is an even more bearish signal. The bulls do not have good strength to push price action up. If the "M" pattern's second hump is higher, this is signalling more bullishness. Keep in mind, Head & Shoulder patterns are more extended "M" or "W" patterns. I found this very interesting. If you place the Fib points at the high and low of the range, 50% retracement of the move is @ 839. For 61.8% retracement, the low Q1'09 just about tagged that right. Who says the market is random? Very interesting. Just wanted to take a quick look at the overall picture of the S&P, which, to me, is more representative of the market rather than the Dow or Nasdaq. As you can see from my chart, we are still in a downtrend, but on a retracement right now. Perhaps the market has reversed, but I'm not really convinced. As you can look at the volume, March's volume was high, but April's was noticably decreased. We're only 1 week into May with another 3 weeks left. If bullish volume this month ends up being decreased from April's, then I would say we are in a retracement phase rather than a reversal. A bullish reversal would have stronger volume tendencies. If this is a retracement, don't count your chickens that the market is going up back to before. The areas to retrace to are typically 38.2% & 50%. You can see that's @ 1014 & 1121 (sorry, this is a little off from my chart as I used the wrong high & low for my fibs), respectively. For those bullish on the market, beware. Of course, I'm bearish, so this is happy for me, but at the same time, it really doesn't matter. Money can be made either directions. I don't have this up, but when the market dropped and began it's assent in early 2003, it only retraced to 25% before going bullish. 25% this time would put it @ 894 and it's exceeded that already. As a technical analyst, artist, musician, this chart is absolutely gorgeous. It is the S&P Quarterly since the beginning of the S&P in 1928. The "M" pattern is lovely. One of the concerns of this pattern is the midpoint of the "M" was broken. This signifies BEARISH. I don't think it's coincidence that this happened. The midpoint was at 815. 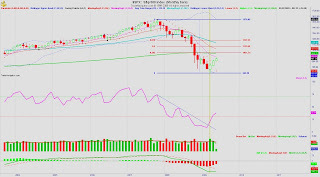 The close of the Mar'09 candle was 797. I can't help but see that those 18 points mean something bearish and the market is saying something very significant and people are delusional. If we take a look at volumes, Q2'08 through Q1'09 are all increasing in volume each quarter to the bearish side. Bullish volume will have to be very strong in Q2'09, coming close to the bearish volume in Q1'09, with a decrease in Q3'09 in bearish volume (or an even greater bullish volume). Now, taking a closer view of the quarterly chart. Q2'09 has not completed yet. We are nearly 1/2 way through this quarter, and that bullish candle be anything. We'll find out on 30-Jun-2009 what that candle will be and it will be important. My expectation is that Q3'09 will be more bearish, with probably a smaller trading range than this quarter. History often repeats itself to some extent. 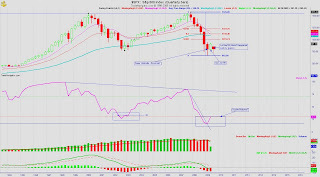 In 2003, we see a double bottom with the right side elevated from the left side, which is a bullish indication. Will that happen this time? We'll see. 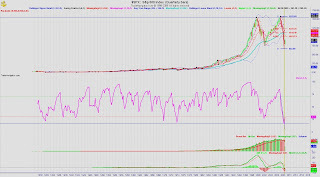 MACD isn't as bearish as it was in 2002-2003 timeframe.